From innovating ultra-thin acetates in the DITA-FEATHERLIGHT collection, to our stainless-steel metal core lamination technique found in DITA-LAMINATE, or the character frames defined within the DITA-SERIES collection, the list of DITA’s innovations in eyewear is unrivaled, offering a vision for the future as memorable as its past. Schema-One proposes a confident new vocabulary for design rooted in strength and restraint, made possible with advances in engineering. The quest for mechanical sophistication and durability inspired designers to apply the precepts of systems engineering to Dita’s existing design process. The outcome: Schema-One, a relentlessly minimal optical frame guided by the notion that simplicity is the ultimate expression of elegance. Each component is precision engineered to eliminate the use of screws, reducing mechanical friction and ensuring that no specialized tools are required in the assembly process. The distinctive top bar — a visual signature that recurs throughout the collection—is forged from a single piece of titanium and acts as a chassis of sorts to anchor the frame’s lightweight acetate lens rim. 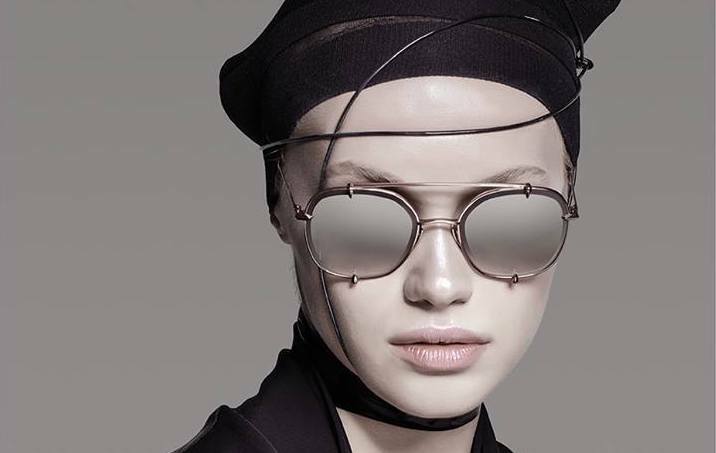 An irreverent P3 frame rendered in lightweight acetate, TOPOS blends two of DITA’s most advanced production techniques in a discerning feat of optical engineering. As part of the DITA-FEATHERWEIGHT series, TOPOS is sculpted from precision-milled acetate and treated using DITA’s innovative heat-tempering manufacturing process. The resulting frame offers the strength of traditional acetate at much lighter weight, ensuring a proper balance of comfort and durability. First introduced in 2003, the SUPA DUPA defied the mainstream trend for small frames with a chunky, oversized acetate frame that would later come to define the “granny chic” trend. Wanting to create a frame their peers would wear, John Juniper and Jeff Solorio looked to their circle of friends for inspiration—models, stylists and creatives—all of whom were digging through thrift stores in search for the perfect oversized vintage frame. With this creative group in mind the SUPA DUPA was born. Sculpted with the grace of wings extended in flight, NIGHTBIRD-ONE’s innovate titanium double frame builds upon years of experimentation with titanium construction. The first in a triad of innovative concept frames for Spring 2018, NIGHTBIRD-ONE relies upon tension to hold the its wing-shaped ombre lenses in place. Previous frames models, composed of a single titanium wire, were engineered to reduce the number of moving components and thus reduce mechanical friction; NIGHTBIRD-ONE’s double frame construction gently cradles the lens between the thin titanium wire, creating a distinct design language for future Nightbird-Series frames. The limited edition frame is engraved with a unique serial number at the temple and released as part of an exclusive worldwide edition of 1,000 pieces. DITA celebrates 20 years as an industry vanguard with the release of its most innovative offering to date: the DECADE-TWO, a turbocharged reboot of the classic aviator frame that highlights many of DITA’s technical advances over the last decade. The melding of past and future, classic and cutting-edge, the DECADE-TWO frame is sleek and lean, with a mesh metal bridge and drill mount two-base lenses that provides a blast of coastal cool to a menswear staple. Signature details, such as DITA’s diamond-press detailing and flexible nose pads, feature in luxurious materials like titanium and 18-karat plated gold hardware.